We are a non-profit service run in conjunction with Malvern Hills NCT by two mothers who aim to increase awareness of, and provide information on, reusable and biodegradable nappy options. We have a demo box with all the different types of reusable and cloth nappies that you can get, including many of the main brands. 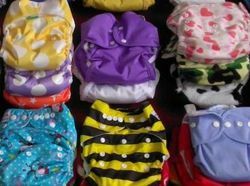 Come and look at nappies, feel the texture, ask questions and hopefully go away equipped with a lot more knowledge, which allows you to buy a style of reusable nappy that suits you and your baby, rather than being overwhelmed and not using them at all. We also provide information on the types of biodegradable nappies available out there. Biodegradable disposable nappies are also a good solution if you are not yet ready to commit to reusable nappies and they don't have to be too expensive. More and more companies are jumping on the eco-friendly band wagon, so prices are coming down and there is a lot more choice these days. We can tell you where to get them locally and what sort of prices you are looking at. With over 700 reusable nappies to loan out so you can trial different types of nappy and find what is best for you and your child. We are always looking for more nappies for our library, so if you have any spare nappies that you no longer need we would love to hear from you.